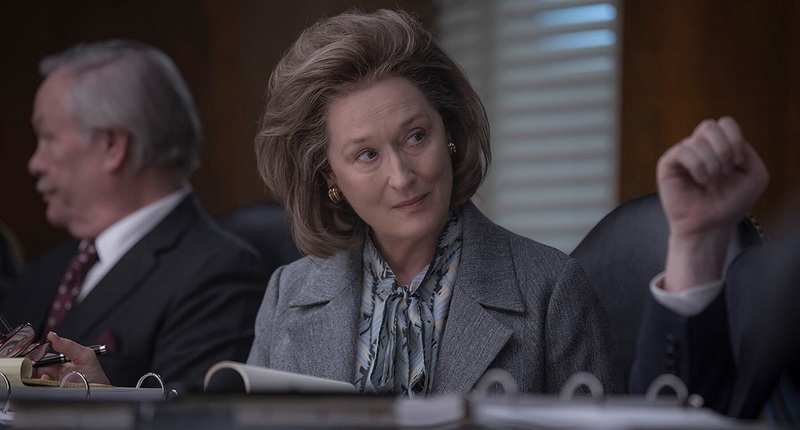 Much of what you'll read in the coming days about Steven Spielberg's supremely entertaining The Post will no doubt focus on how timely the film is in regards to the current administration in the White House, the freedom of the press (or lack thereof I should say), the ballooning of "fake news" and the dwindling presence of actual newspaper offices. All those parallelisms are valid, and were no doubt the primary themes screenwriters Liz Hannah and Josh Singer (Spotlight) set out to establish, but now that I've watched The Post twice I think there's something else being pulled into focus here. More on that later. The year is 1971 and The Washington Post publisher Kay Graham (Meryl Streep) is on the eve of taking her newspaper company public. The paper has been in her family since the dawn of time, and following the passing of her husband (the paper's previous publisher) Kay's been tasked with securing the future of the business against the pressing reality of the company being "cash poor." Kay herself is set up nicely at her home mansion, having soirées and dinners with the cream of the crop in Washington D.C. -- but she genuinely does love the newspaper biz and has a quiet yearning to win the admiration of her work-addled staff, so making sure there is an actual future for the paper is the utmost priority. Meanwhile her executive editor at the paper Ben Bradlee (Tom Hanks) is coming up against a different kind of dilemma, one that isn't fiscally-focused. Ben is in a mild existential crisis of fulfillment. During a staff meeting he asks everyone if they're tired of reading the news instead of actually writing the news. It's an allusion to their upper echelon competition, The New York Times, which seems to always be one step ahead in both cunningness and content. Throughout all of this, Spielberg informs us that a groundbreaking story on the current war in Vietnam is about to drop in the most Spielbergian way: by *showing* us. Once again working with his clutch director of photography Janusz Kamiński, we're shown the unimproved military presence in Vietnam through the eyes of writer and activist Daniel Ellsberg (Matthew Rhys) along with the interception of key a study on the Vietnam War commissioned by the Pentagon's Robert McNamara (Bruce Greenwood) that will later come into the hands of The New York Times. From a story point of view, that is essentially what The Post is "about." A rat race between newspapers trying to get the news right and then out to the public as fast as possible. And considering that the story both papers are chasing involve the government lying to the American people (about the projected success of the Vietnam War) it only makes the plot of The Post resonate even more. It's 2017 and we take the anticipation of stories and news for granted. In an age of Twitter and instant gratification, the vigorous satisfaction of discovery, curation and delivery has been overshadowed by cantankerous yelling and bombastic tweets disguised as breaking news. The Post takes us back to the core value system of why we share the news we do and how we do it and who it affects and what should be considered news. Finally, going back to what I said earlier in this review, I think the film also -- brilliantly -- focuses on the voice of women. It's no accident that the first images of men we see are that of combat but the first image of Kay we see is in her nightgown in bed, surrounded by binders and notepads. Early on we see Kay approaching a board room of bankers and investors before cutting to her point of view as all the old white men slowly turn to her, already disapproving of her. Passive aggressive comments and backhanded compliments surround Kay; she's drowning in it. So when the third act of The Post centers on whether or not Kay will green-light the publishing of said Pentagon Papers in spite of threats from the Nixon administration, it is really engrossing. The motif is strong. It's literally Kay's voice (on the phone) that will decide the course of The Washington Post's fate and, on a broader scale, the freedom of the press. It's truly thrilling. Near the end of The Post, there's a scene of Kay walking down the steps of the Supreme Court. There's a large crowd of spectators. A good portion of them are women. The way Spielberg and Kamiński frame that shot, with the awe-inspired eyes of the younger women looking at the powerful publisher, you'd be lying if you weren't reminded of Hillary Clinton and the significant cultural landmark she's been, especially for women. The #ImWithHer movement is pulsating in that shot. Spielberg has been lukewarm as of late (Bridge of Spies, The BFG) but fortunately The Post ends up being his best film since 2005's Munich.